This Thursday, July 10, 2014, was a good day for a deacon. We were up before 6am headed to the hospital to visit a relative of Bishop Sekelwa’s wife. 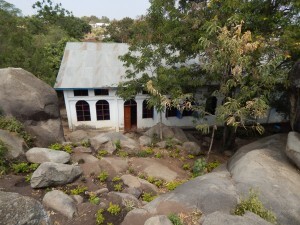 Bishop said that this was the third largest hospital in Tanzania and the best in Mwanza. It was built by the Israelis and is part of a college run by the Catholic Church to teach doctors. The building is 8 stores tall and looks like a medium sized hospital in America on the outside. But once you go inside, you remember that you’re in Africa. There were very few nurses and not much in the way of support staff in the area that we went to. The lady that we visited was in a maternity ward with 5 other lady’s. This was a large room with no curtains and it was not very clean, not as dirty as some I’ve seen but still a lot dirtier than anything in the US. It’s pretty shocking for an American to see a hospital this dirty but this is the best that they have. So while Bishop and Martha visited, I just prayed for Mercy to abound. When we got ready to leave, they asked me to pray. What a privilege it is to pray for one of God’s children who has so little yet has so much of His love. I’m always reminded that as much as my heart might ache for my brothers and sister here, it’s nothing compared to the ache that is in God’s heart for His children. The rest of my morning was spent here at home resting and getting ready to preach this Sunday. In the afternoon, I was invited to join two of the pastors who meet at the church from 1:00 to 4:00 every Thursday to pray for people. Sometimes they have appointments but most of the time they just wait for people to show up with a need. Sometimes no one comes for prayer but they are still there every Thursday. This Thursday we only had one person show up to talk with the pastors about a youth conference that was coming up in August. Still, I had a good time hanging out with them. Besides, I got to walk to the church by myself (about a half mile) and back home. That is always an adventure in itself. Thursday goes down as a good day for sure! ← The Best Sermon I’ve Ever Preached! !